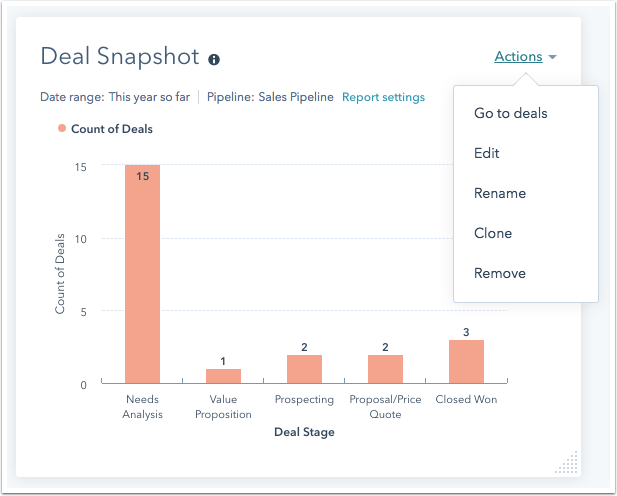 Your marketing, sales, and service dashboards have default reports, but you can customize your dashboards. The same is true for any other reporting dashboards you've created if you are using the reporting add-on. Click the name of the current dashboard and select the dashboard from the dropdown menu. Please note: there is a limit of 10 reports per dashboard. 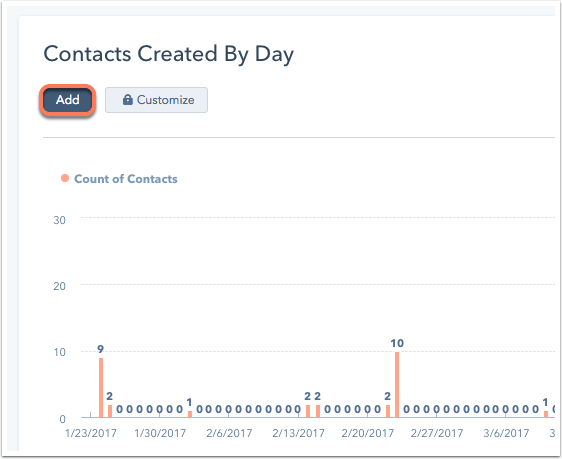 If you want to add more reports, you can create a new dashboard or remove reports from the current dashboard. Search or browse for a report or, if you have the reporting add-on, click Create custom report to create a report from scratch. Click Add to add a report to your dashboard. If you are a Professional, Enterprise, or Reporting add-on user, you can customize the reports on your dashboard. Please note: the number of reports you can customize depends on your product subscription. Click the name of the current dashboard, and select the dashboard from the dropdown menu. Hover over the report you want to edit, click Actions in the upper right corner, and select Edit. If you're updating a standard dashboard report, select Clone to create a new version of the report to customize. Make edits as needed, then click Update on dashboard. Learn how to build and customize reports. To reorganize the reports on your dashboard, click the report you want to move. Drag and drop the report to the desired location on your dashboard. To resize a report to be half or full width of the dashboard, hover over the bottom right corner of the report. When the dotted sizing arrow appears in the corner hold your left mouse button down and drag left or right to increase or decrease the size. To rename a report, select Rename. In the dialog box, enter a new name in the New report name field, then click Save. To clone a report, select Clone. In the dialog box, enter a name for your new report in the Report name field, then choose to add your new report to an existing dashboard or, if you have the Reporting add-on, create a new dashboard. Click Clone to existing/new dashboard. To remove a report from the dashboard but not delete it, select Remove from dashboard. To delete a report completely from the portal, select Delete.